It was a clear evening and cold. A full moon illuminated the streets below, the white stucco of Pimlico and the red brick of Chelsea. 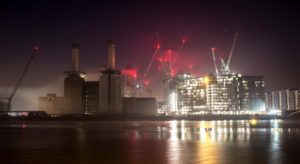 Red hazard lights twinkled like stationary fireflies around Battersea Power Station, as the commuter trains rumbled out of Victoria, towards river and bridge. The small group gathered for tea and buns in Holy Trinity Church, Sloane Street. The church was designed by John Dando Sedding, who belonged to the Arts & Crafts movement and even a quick glance at the church’s web-site illustrates the artistic heritage which is celebrated here as well as the Christian faith. 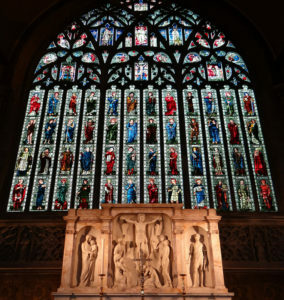 Its huge east window was designed by Edward Burne-Jones with Morris & Co and we were there at the start point of a walking tour about Sir Edward Burne-Jones, famous pre-Raphealite artist and designer and the myths and legends which feature in his paintings. This was the first ever walking excursion from Tate Britain and we were lucky enough to be on it. Our guide and storyteller was Rebecca Leach who lead the group out into Sloane Square, its trees light-bedecked for Christmas, to the rear of the church where the window could be seen back-lit. 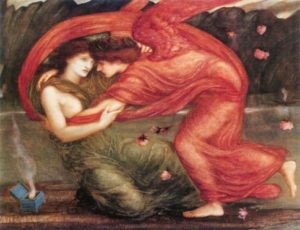 There she began the tale of Merlin and Nimue, the wizard’s pursuit of the young woman and his eventual enchanted incarceration, depicted by Burne-Jones. ‘Dirty old man,’ someone remarked. ‘MeToo Nimue’ said someone else. Thence to Orange Square and the tale of Sir Lancelot and the Tree of Shields, by way of Bunhouse Street (site of the Chelsea Bun House inventors of said bun – where on Good Friday in the eighteenth century they would sell over 250,000 buns, apparently). On Ebury Bridge the headsets came into their own, we could hear Beckie telling us the legend of Cupid and Psyche above the constant clack and rattle of the trains below. Into Warwick Way, formerly a raised causeway surrounded by market gardens, as we entered the Abbots Manor and the high-rise former council blocks gave way to stuccoed villas. To Tachbrook Street, which marks the subterranean route of the Tyburn (a river close to my heart at present) and the story of Briar Rose, subject of a series of epic paintings by Burne-Jones, then across Vauxhall Bridge Road to Vincent Square, where we take up the Cupid and Psyche tale again. I thought I knew this legend, but there were details new to me. I remember reading Roger Lancelyn Green’s version of this and others when a child, along with The Yellow Book and others in the series. A welcome break at the Windsor Castle public house and lots of good chat, especially with Marcus Dickey Horley, Tate Curator of Public Programmes, who was interested in doing a similar, artist-based walk, in South London, possibly in partnership with the Clapham Book Festival. Then on to more tales, the full moon now high in the sky, permitting madness. 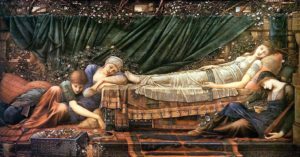 Finally to Tate Britain for a private view of its Edward Burne-Jones exhibition and a final tale, the Italian version of Briar Rose, rather more grim even than the Grimm version heard earlier. And a whole hour to roam the almost empty galleries, enjoying all the works, but especially those whose stories we had heard out in the moonlight. Thanks to Beckie, Marcus and Isabella for such a wonderful experience (and here’s hoping for many more, this is such a wonderful addition to the Tate programme). This entry was posted in Art, Books, Culture Vulture and tagged Art, London, Worth a visit by juliej. Bookmark the permalink.